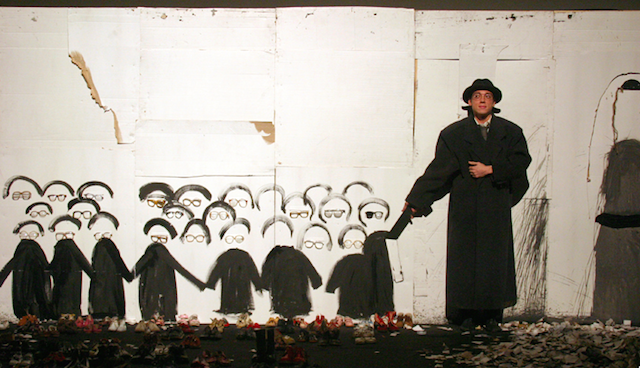 A white cardboard background and a black floor are the stage of Opus No 7, the award-winning play by Russian theatre director and artist Dmitry Krymov and his Laboratory. 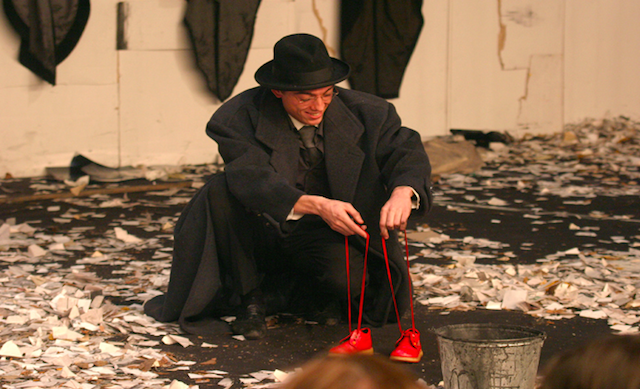 Krymov's production of Opus No 7 was launched in 2008 and it has since toured all over the world, winning the approval of critics and audiences. The surreal play is now on stage at Barbican for a short period and it's almost sold out, so you'd better book now if you don't want to miss the excitement. Passing through the backstage to get our seat, we are invited to sit at the same level as the acting cast and watch (eventually stare) the events happening under our noses. The play is divided into two distinct acts, which evolve during a two-and-a-half hour performance. The actors speak little, and in Russian, with TV screens on top of the stage to show English translations. The first part is called Genealogy and it evokes the Holocaust, and the lives and stories of Soviet Jews during that period. The actors populate the stage as if they were ghosts, singing deeply sad melodies. One of the most astonishing and dramatic scenes is when they suddenly throw black paint at the white cardboard. The visual effect is striking, every blot of colour turns into a human figure (Soviet Jews) thanks to the use of wires and fabrics but most of all thanks to the audience's imagination. 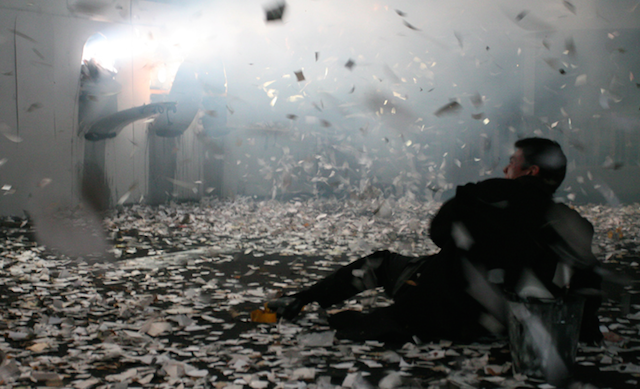 The acting keeps on in a tumultuous rhythm until the public gets flooded with paper scraps in a sudden gust of wind. So do the actors, who then find names, life stories and memories of dead people in those same pieces of paper — an evocative and imaginative reconstruction of the void left behind by the Holocaust. The second part, Shostakovich, depicts the tortured life and career of the Russian composer, recognised as one of the most important musicians of the 20th century in Stalin's USSR. 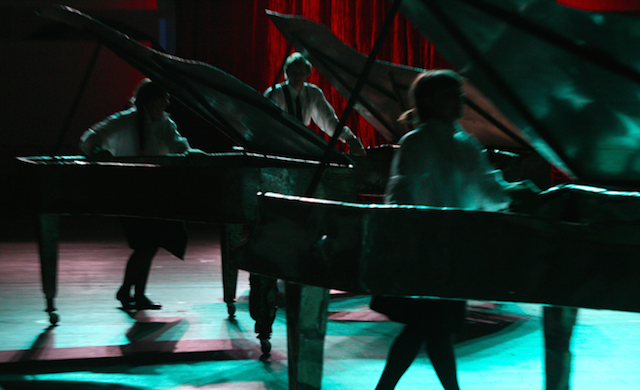 The act opens with a huge rudimental structure of a piano in the middle of the scene and an extra-large puppet that represents Mother Russia, moved by silent and quick actors. A female actress enters the scene and embodies Shostakovich. 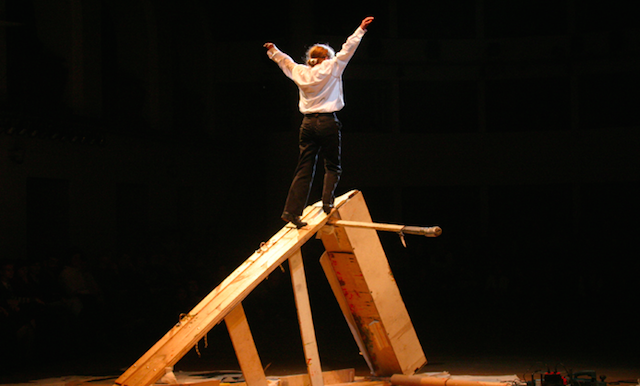 She climbs and jumps over the wooden structure and shapes her body with improbable poses. The acting is nervous, spasmodic and deeply emotional, clearly influenced by Krymov's background as a visual artist. The finale is powerful, noisy and bold: Shostakovich is turned into a puppet, his truly artistic soul is gone as he bends himself to the artistic regime of the USSR and Mother Russia shows her controlling power by killing Russian revolutionaries and forward-looking artists of the time. Finally, actors enter the scene with metal pianos and start crushing them one against the other, creating a disturbing noise that makes us think about the power, the surrealism and the meaning of the whole play. Opus No 7 is not just a play: it's performing art, it's visual madness, it's physical expression. Dmitry Krymov recreates on a stage something, we bet, you've never seen before. And, if you missed this show for any reason, Krymov and his Lab will be back at Barbican in November with another play — A Midsummer's Night Dream (As You Like It). Opus No 7 is on stage until 14 June at Barbican Centre, Silk Street, London EC2Y 8DS. Tickets are £30+bf, seats are unreserved. Londonist saw this play on a complimentary review ticket.